Samajwadi Party (SP) state unit chief Akhilesh Yadav on Friday hit out at Congress and said it was the because of the party that the Mayawati government could carry out its rampant corruption in Uttar Pradesh. "Who has allowed the elephant (Mayawati's Bahujan Samajwadi Party symbol) to grow fat? It is the Congress who has allowed the 'elephant' to grow in UP," Yadav told a national news channel on Friday. "Congress and the party leaders got several oppurtunities to work but they did not do it. It is due to their failure that people have not been able to associate with them," he said. "If Uttar Pradesh is in a completely bad state today, then it was Congress' duty to set things right," he said. Hailing the decision of EC to cover statues of Mayawati and BSP symbol Elephant, Yadav said that it was a good decision. 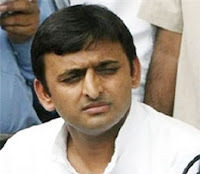 On seizure of money by EC teams, Akhilesh said that it should not be done to harass traders.